Why Buy Bluegreen Resort's Grande Villas at World Golf Village? 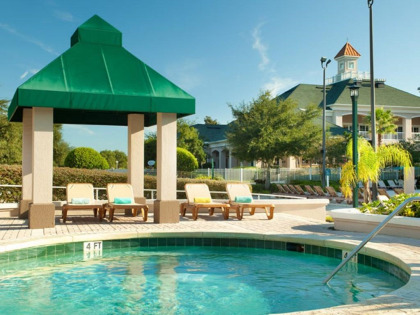 When you buy a Bluegreen Timeshare in beautiful St. Augustine, Florida, luxury and comfort await. Overlooking two golf courses designed by four members of the World Golf Hall of Fame, the villas feature amenities galore. Choose from one- and two-bedroom accommodations that include a private hot tub, community swimming pool and private tennis court as well as a location that is highly desirable. Bluegreen timeshare resales provide access to 43 miles of beaches where a variety of fun may be enjoyed. From parasailing to scuba diving, surfing, swimming and sunbathing, there are numerous activities available. The city of St. Augustine has many attractions providing something for everyone. The Family Fun Factory, Fountain of Youth Discovery Park and St. Augustine Lighthouse and Museum are nearby. Added to the advantages enjoyed when buying timeshare resales here are the many dining and shopping venues. Saint George Street is a wonderful place to find shops that sell souvenirs and boutiques and this location often features street entertainers for the enjoyment of visitors. An IMAX theater, the World Golf Hall of Fame and the PGA Tour Stop – the U.S.’ largest golf attire and accessories shop – are a few more of the interesting places to visit in St. Augustine. Part of the charm of St. Augustine is the sense of history experienced by taking a stroll down the streets of the nation’s oldest city. Museums abound providing a great deal of information for those who are interested in the early Spanish colonists who settled in this area. Bluegreen timeshare deals provide the perfect place for a getaway. Golf is just one of the reasons to buy Bluegreen Resort’s Grande Villas at World Golf Village. There are many activities for non-golfers who buy a Bluegreen timeshare as well. Volleyball, basketball, tennis, a fitness center and swimming or relaxing around the outstanding pool, which has a waterfall and rock formations are just part of the leisure activities to be found. When you choose from the available Bluegreen timeshare deals, the possibilities are limitless. Those who buy Bluegreen Resort's Grande Villas at World Golf Village will experience luxury living with a spectacular view of the meticulously manicured estate. Many of the villas have balconies and are perfect for enjoying the beauty of this area. They include one and two bedroom villas with full kitchens, cable TV, washer/dryer, whirlpool bath and the two-bedroom will accommodate up to eight people. 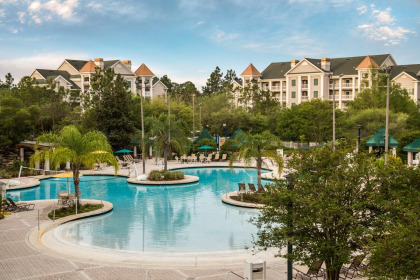 A timeshare resale in World Golf Village is the perfect location for a family vacation, getting away from the hustle and bustle of business or a romantic retreat. If you choose to sell Bluegreen timeshares for any reason, the villas at World Golf Village are located in one of the most highly desirable areas. St. Augustine is a popular tourist destination. Year round mild temperatures, the location near beaches and the Atlantic Ocean and the relaxed lifestyle as well as the natural beauty of this area are enjoyed by many each year. Many people sell Bluegreen timeshares at one location and choose World Golf Village for their next timeshare. As a golf destination, Bluegreen timeshare resales provide the avid golfer with courses that Golf Digest consistently awards four-and-a-half stars out of a possible five. World Golf Village’s King & Bear and Slammer & Squire courses have hosted many professional tournaments, such as Shell’s Wonderful World of Golf and Liberty Mutual Legends of Golf. King & Bear is a 7,279-yard course and is one of Golf Weeks Top Resort Courses. Slammer & Squire is a 6,939-yard course with holes providing a view of the World Golf Hall of Fame. Both are set amidst the natural beauty of this area, including 200-year-old live oaks, wetlands, lakes and woodlands. Timeshare resales at Bluegreen Resort's Grande Villas at World Golf Village are one of the best choices for an affordable vacation destination with an abundance of amenities, beautiful surroundings and luxurious accommodations. Contact Bluegreen Resort's Grande Villas at World Golf Village Specialist Today!